The Government of India has said that there will not be any movement towards increasing the height of the Narmada dam from the present 122 metres to 138.64 metres, which is the full reservoir level, till the last oustee is rehabilitated. 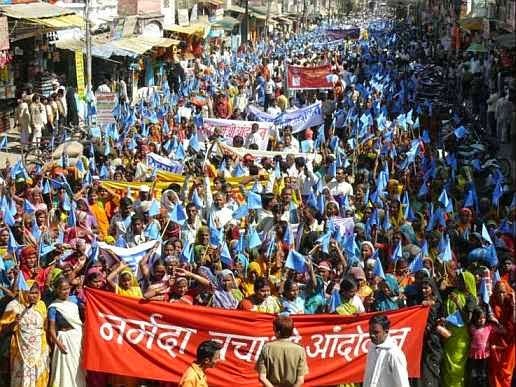 The declaration came at a meeting of representatives from the Narmada Bachao Andolan (NBA) led by Medha Patkar in Delhi following two-day dharna by hundreds of oustees affected by the dam from Madhya Pradesh, Maharashtra and Gujarat at Jantar Mantar. Union minister for water resources Harish Rawat, who met a 10-member delegation of the oustees, led by Patkar, assured the oustees that the dam “cannot move ahead until the last person is rehabilitated and that his Ministry, which leads the Narmada Control Authority, will have to ensure rehabilitation, environmental compliance and a comprehensive cost-benefit appraisal before permitting any decision on the dam height. “The minister and his officials heard a presentation on the massive scale of pending rehabilitation of 48,000 families, ongoing judicial inquiry into Rs 1,000 crore corruption scandal in Madhya Pradesh and severe non-compliance on environmental measures and dismal performance of the SSP, after an investment of Rs 70,000 crore rupees”, a statement issued in Delhi by the National Alliance of People’s Movements (NAPM), an apex body of several NGOs across India, said. “The minister directed his officials to seek a report from the three state governments, particularly Madhya Pradesh, on the status of compliance with the orders of the Grievance Redressal Authorities (GRA), binding as per the judgment of the Supreme Court, even as taking cognizance of the orders and reports with regards to the ongoing processes of inquiry into corruption by the Jha Commission and the GRA and admitted that the official process itself is clear to prove that rehabilitation is far from complete”, the NAPM statement said. He assured the traditional displaced fisher families have “the first and inviolable right to fisheries in the reservoir and the state governments are legally duty bound to register the cooperatives of the fish workers”, even as promising to look into the “serious issue of exclusion of 55 villages and a huge township from submergence by changing the backwater levels, which have even been disapproved by an Expert Committee of the Ministry of Environment and Forests (MoEF)”. Later in the evening, a larger delegation met Sudhir Bhargav, chairperson, resettlement and rehabilitation subgroup, NCA, and secretary, ministry of social justice and empowerment, who said no final clearance has been granted to increase the dam height. He said this in response to the oustees’ view that neither the GRA of Maharashtra, not that of Madhya Pradesh, has given consent to raise the dam height and there is absolutely no case for permitting further construction. He was told that Madhya Pradesh has fraudulently presented consultation of the ‘former’ GRA in the last meeting of the R&R subgroup, while even as on date, there are hundreds of orders of the former and present GRA yet to be complied with and hundreds of pending complaints. “Project affected families from Gujarat also complained about the pending issues of land allotment in the original villages and R&R sites”, NAPM statement said. The secretary said, there was a need to initiate a process of field verification in sample villages, to begin with, to assess the status of rehabilitation. In a third meeting with Union minister for rural development Jairam Ramesh, who had recently visited the submergence area in Madhya Pradesh and witnessed the scale of pending rehabilitation, a similar assurance was given to the delegation. Meanwhile, NAPM claimed, NBA dharna received “wide support from writers, academicians and advocates”. Those who visited the dharna included writer Arundhati Roy, Annie Raja, president National Federation of Indian Women, Prof Manoranjan Mohanty of the Delhi University, Dr Prakash Jha, well-known environmental expert, Sagari Chhabra and Sanjay Kak, prominent documentary film makers, Kumar Prashant of the Gandhi Peace Foundation, among others.